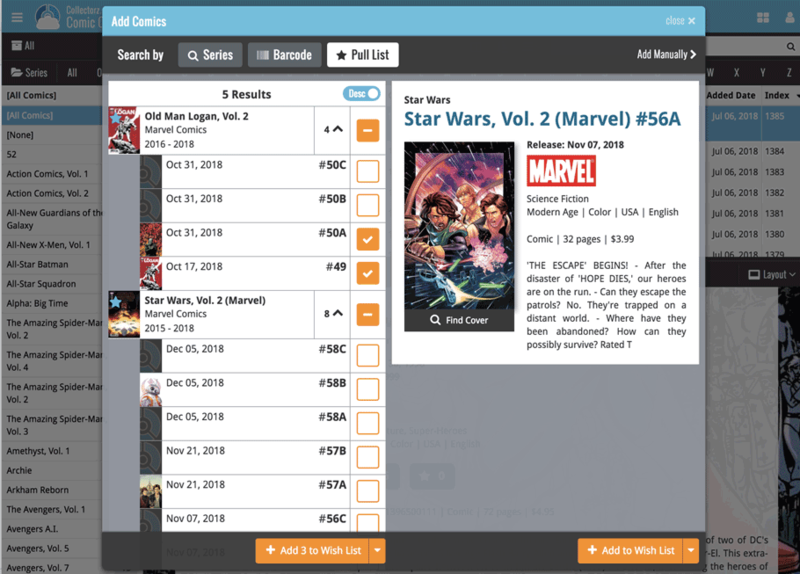 New in your Add Comics screen: a Pull List tab, a useful tool for listing your favorite comic series, so that you can easily find them when you add your weekly purchases, or for quickly adding upcoming releases to your wish list. To add a series to your Pull List, first find it using your Series or Barcode tab. Once you found your series, hover your mouse over the series cover to reveal a white star icon. Click the star to add this series to your Pull List. Then, click the Pull List tab to reveal the series on your Pull List! Expand a series to see which issues have been released in the last 2 weeks, or still have to be released, and if you want, add them to your wish list!